Supporters rally in support of Gaza. 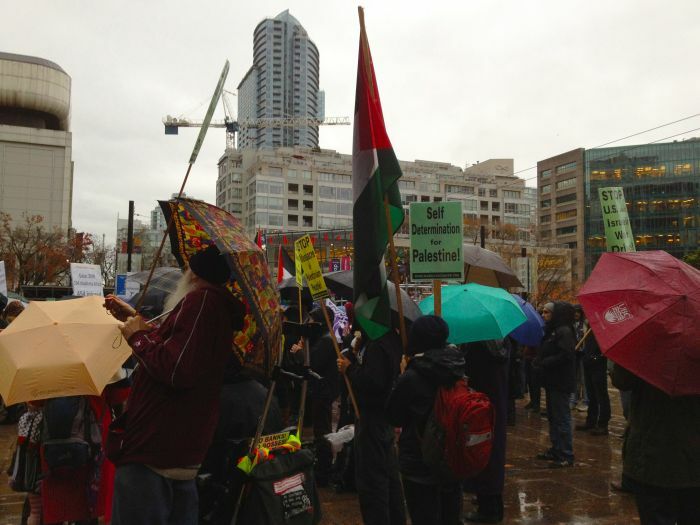 Vancouver, November 18, 2012 – Palestinian youth voices are spotlighted on Sunday in a rally for Gaza in front of the Vancouver Art Gallery. Local activist groups show up for a second day in support of Palestinians in the recent Israel-Gaza conflict. A crowd of hundreds gathered to march through the downtown core and listen to speeches in the rain. Linda Todd Ghareeb, a motivational speaker who used to teach English conversation in Gaza, shared some of her former students’ reactions through email on what’s going on in the ground. Adam Kharma, 13, writes that bombing is something that they’ve gotten used to. “Even parents who are known as their children’s heroes can’t do a single thing [for their] kids,” he says. Nour Kharma,19 and an aspiring lawyer, says that there is an unequal use of force in the conflict because Israeli technology is more advanced than Palestinian ones. For Raneen Haddad, 19, a bomb landed just under her living room window. “I felt like it bombed in the living room,” she says. After the bombing stopped, she found her house covered in dust, sand and glass. Zain El Rayyes, 16, also says that many people have lost their houses. She notes the dangerous situation with ambulances constantly in the streets. “The situation here is so dangerous! We are not sure if we will stay alive for the next day!” she writes. “I am not asking to support us; I am just asking to be neutral,” El Rayyes says.